I’m thrilled to tell you that I have partnered with Wisconsin Cheese to tell you all about the 2017 Grilled Cheese Recipe Showdown! 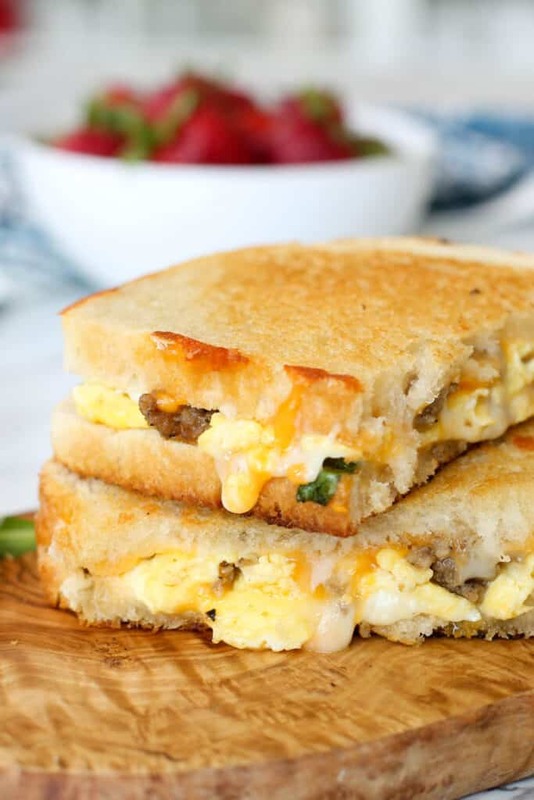 Today I’m sharing one of our favorite breakfasts with you, the Breakfast Grilled Cheese. The Breakfast Grilled Cheese starts with a slice of buttered sourdough bread sprinkled generously with Wisconsin colby, monterey jack, and cotija cheeses. Next, add a layer of fluffy scrambled eggs and spicy hot breakfast sausage. Finish with another layer of the cheeses, a small handful of arugula or baby spinach, and a little more cheese. Top the sandwich off with another slice of buttered sourdough. Cook until melted and gooey inside, while crisp and lightly browned on the outside. I dare you to resist this one. Want to know how to win $15,000? The Grilled Cheese Academy and Wisconsin Cheese are awarding some truly amazing prizes to the finalists in this year’s recipe showdown. Do you think you have what it takes to come up with an amazing, mind-blowing, grilled cheese sandwich? Get yourself entered! If you’re a fan of classic grilled cheese sandwiches, check out my Guide To Making Perfect Grilled Cheese. Kitchen Tip: I use this skillet and this spatula to make this recipe. 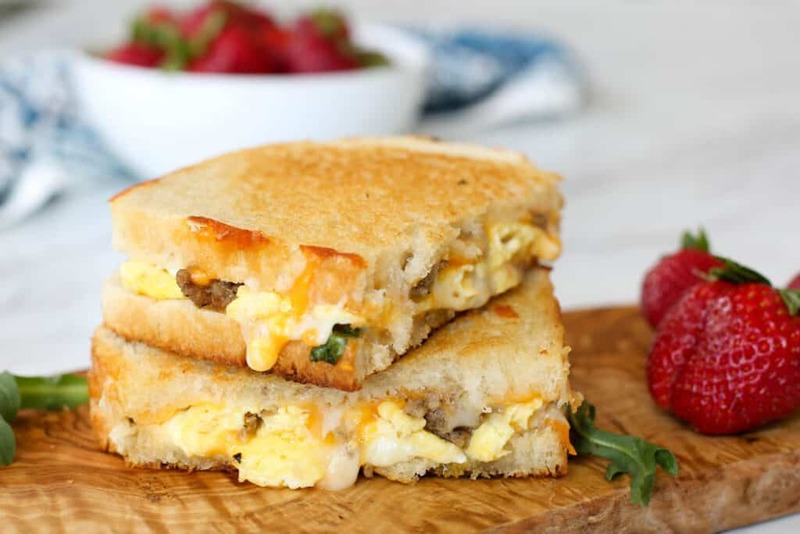 Melting cheese and fluffy eggs are stacked with sausage and arugula to make this irresistible breakfast sandwich. In a large nonstick skillet, cook and crumble the sausage over medium high heat. Transfer the cooked sausage to a paper towel lined mixing bowl. Break the eggs into a bowl. Add the water to the eggs and whisk to combine. In a large skillet over medium high heat, melt the butter and swirl to coat. Pour the egg mixture into the middle of the pan (you want the butter to move to the edges of the eggs in the pan) and cook without stirring for a minute or two. Sprinkle with crazy salt. Once the eggs begin to set, gently stir or fold the eggs as needed until the liquid is almost completely gone. Remove from the heat while the eggs are still slightly wet. (They will continue to cook while in the pan.) Add the cooked sausage and stir gently to combine and break up the eggs. Transfer the eggs and sausage mixture to the bowl that was holding the sausage. Shred the cheeses and mix them together in a bowl. Wipe out the skillet with a paper towel if needed and return to the stove. Butter 1 side of each slice of bread. Warm the skillet over medium heat. Place the bread buttered side down in the hot skillet. 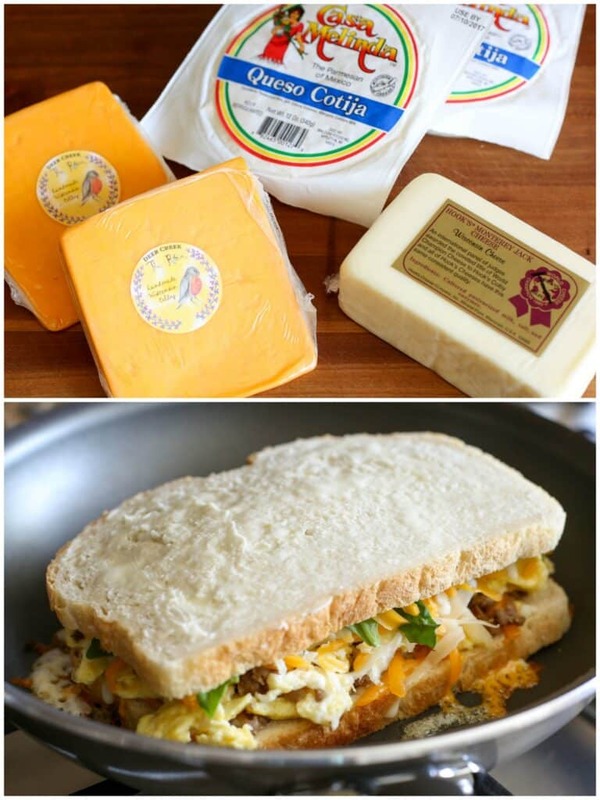 Sprinkle the bread lightly with 1-2 tablespoons of the cheese mix. Scoop about 1/2 cup of the scrambled eggs and sausage onto the bread and use the spatula to break it up a bit to cover the bread. Sprinkle generously with about 1/4 cup of cheese and layer a few pieces of arugula or spinach over the top. Add 1-2 tablespoons more shredded cheese and top with the second slice of buttered bread, buttered side on top facing out. Cover the pan with a lid (this helps great steam to melt the cheeses) and cook for 3-4 minutes until the cheeses start to melt, if the bread is browning too quickly, reduce the heat slightly. When the cheese begins to melt, and the bread is crisp and golden brown, slide a spatula under the sandwich and flip it over gently. Cover with the lid again to help finish melting the cheese. When the sandwich is golden brown on both sides and melted throughout, transfer to a cutting board and slice in half. Serve immediately. Repeat for each sandwich. Enjoy! When I'm making this recipe, I typically double the sausage and the eggs and keep the extra amounts in the refrigerator to make an easy breakfast the following day. 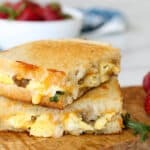 If the sausage and eggs are already cooked, it will only take a few minutes to cook these sandwiches. Disclosure: I’ve partnered with Wisconsin Cheese to share the Grilled Cheese Recipe Showdown with you. Thank you for supporting the brands that make Barefeet In The Kitchen possible. As always, all thoughts are my own. I love that you used three types of cheese! This looks phenomenal!